FREE SHIPPING TO AUSTRALIA/NEW ZEALAND AND $10 TO EVERYWHERE ELSE! A massive value pack of children’s educational products with loads of fun products which all match together for interactive enjoyment and learning for your little ones! For singing, reading, vocal play, pretend play, dance, musical activities, creative movement – at the same time stimulating your child’s language, cognitive, social, emotional, motor skills and physical development. The set includes 17 great interactive products for the complete sensory experience for children encouraging their auditory, visual and tactile development, all in an engaging way! 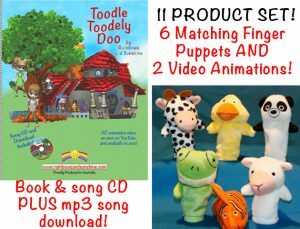 • 4 Downloadable videos of the 3D animations that match these books – 2 original and 2 with the words onscreen to make it easy for adults or children who can read to sing along. Very handy to have on your phone, device or laptop! 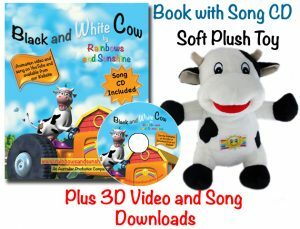 • 2 Downloadable mp3 files of the songs “Black and White Cow” and “Toodle Toodely Doo” which means you can play the songs anytime – kids love to sing along and listening encourages their imagination too! • A beautiful plush toy cow (21cm high) who features in “Black and White Cow“, “Toodle Toodely Doo” and our other videos! 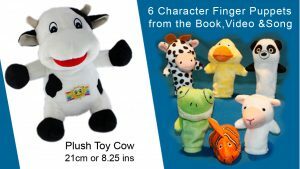 • 6 super-cute finger puppets which match the books – the cow in “Black and White Cow” and each of the animals in “Toodle Toodely Doo”. In “Toodle” each animal comes to visit the family and says “Hello” in a different language – educational and fun! And for a limited time only FREE SHIPPING within Australia and New Zealand and low cost shipping overseas. Below you can see previews of the two books, hear the songs and preview the videos (your two videos will have the lyrics onscreen and, like the songs, can be played offline anytime on your computer, device or phone), and an image of the accompanying toys! Above: The Toodle Toodely Doo products included in your 17 product gift set.